Grown for the sweet black berries Melastoma affine gets the common name of Blue Tongue from the stains that the fruits leave on hands and mouth. The natural environment is in northern Australia, from the Kimberly in the west right across to Queensland. It will grow in cooler climates with little care. This is an excellent plant for attracting bees, pollen seeking insect and birds to the garden. It is suited for use as a hedging plant and white flowering variety, Melastoma affine alba is also available. Also known as the Native Lasiandra, and it is related to Lasiandra. 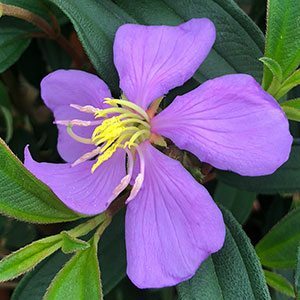 This is a plant that requires a little shade, especially in warmer climates during summer. A humus rich soil is best, and good drainage is essential. Although this plant comes from northern Australia it is a rainforest plant, it will not grow well in very cold climates. 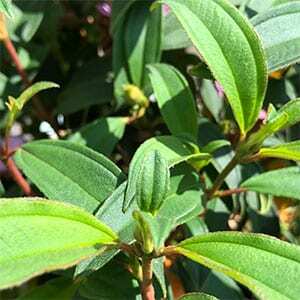 As this is a fast growing plant you may wish to prune it to keep it more compact. Regular light pruning is recommended. Common Names – Blue Tongue, Native Lasiandra, Dhumulu. Height – From 1 – 3 metres. Flowering time – Spring through to summer, in warmer climate and good soil, almost year round..